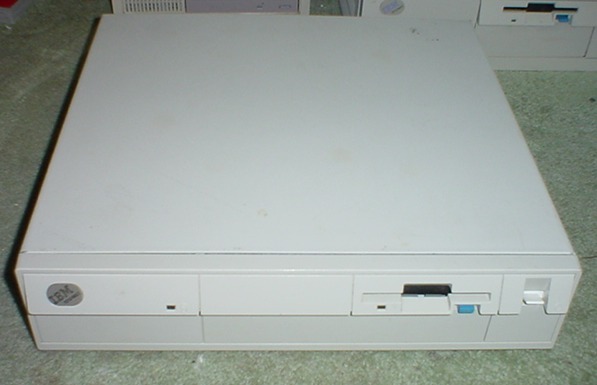 Background: IBM's Model 53 PS/2 computer came about as a result of a series of "special bid" Model 55sx computers that were outfitted with what's known as a Reply Board. Simply put, a Reply Board is a "bolt in" replacement planar for your PS/2 that offers better performance, and some other little extras. This "special bid" series of Model 55sx became so popular that IBM introduced the Model 53. It had the Reply Board already installed--and also a slightly redesigned case with standard power plugs inside. IDE is far from perfect, but in this system, it is a really nice feature. Unfortunately, instead of using a "real" 486 processor, Reply chose to use an IBM 486SLC processor. This processor is a mix of many various technologies--it has a 16/24 bit data/address bus (same as on the 286), but it is internally clock doubled (like the 486 line of procesors) and it can run 486 instructions. Basically, although this is an improvement over the 386SX-16 processor used in the model 55sx, it is still somewhat limiting. At first I was thinking this thing would be a real dog under pretty much anything besides DOS and Windows 3.x. Just for fun, I installed Win95 on it, with 12MB of RAM and a 420MB hard disk. I was so surprised at the performance you could have knocked me over with a feather! Even with only 12MB of RAM (now 16), Win95 runs on this machine like it was made to do so. Even Internet Explorer 5.0 is very fast--faster than on any of my clone 486s that are around here. The first 53 could not be made to work under Win95 with protected mode IDE drivers in place. The current unit is much better about this--as long as a "no serialization" driver is selected, the IDE works fine. Not bad--who says a machine never exceeds the sum of its parts?